Planning content for a new website is crucial to ensure your site is authoritative in search engine results, attracts the right kind of people and keeps them engaged onsite. There’s many things to consider here: What can I use from my current website? What pages do I need? What about keywords for SEO? How do I write appealing copy that ranks well? How and when do I need to complete content tasks within the web design & development process? The content planning and strategy process can be time consuming and overwhelming, so we’ve broken it down to 5 steps below to help you out. We understand the web design & development process, and experience tells us that a strategic content plan always helps ease web development time and cost, as well as increase the success of your new website. If you need advice or content strategy services, contact us today. What’s already available that’s useful to my audience? What’s missing that my customers ask about, or would be useful to have onsite? What’s not correct that needs updating? Unless you’ve kept your current site up to date, chances are your business has changed and you’ll need to include more products or services on your new site. Look for the gaps and what’s already available that can be transferred to your new website. Tip: If you’ve got Google Analytics installed on your current site, analyse which pages get viewed the most (and the least) and how people funnel through the site. This provides valuable insights to demanded pages, products and services to include on your new site. Timing: Ideally you can evaluate current content before your new pages are confirmed and you enter the development process. Even pre-design, this can aid your web designer around the tone and feel of your new site. Who exactly is your website for? Who is your target audience and your ideal customer? Many businesses have a primary target audience and secondary target audience(s) that have different motivations, perceptions and hesitations. Understanding and identifying key target audiences is important to create clear, consistent messaging that resonates with your ideal customers and promotes conversion onsite – whether it’s buying from you, subscribing or making a contact enquiry. What is their purpose for your product or service? What perceptions do they have about your product or service? What biases and hesitations do they hold that would lower their chance of conversion? Often your sales teams or people on the phones with customers will have good insights in terms of frequently asked questions, returns and motivations for buying. Tip: If you can’t establish your target audiences yourself, enlist the help of a user research company of partake in user surveys to understand your customers better. Timing: Establish your target audience before design and development and the other content steps here. This is the first step on the pathway to keyword discovery and page mapping. 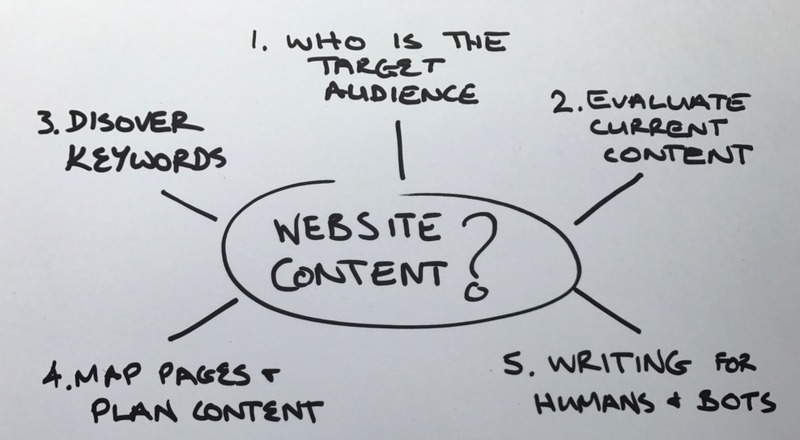 Now you know your audience, but before you start mapping your new pages and plan content tasks, you need to clearly establish your website’s target keywords and how these people use the web. From here, you can start to discover the keywords they will use in search engines to search for you. Group keywords into themes or topics can that help with the structure of your website. With the help of keyword research tools and analysis, you can determine where search demand lies for your keywords and what to prioritise. Tip: Many people are influenced by what appears as suggestions when they start typing into Google. These Google suggestions are based on real content that lives on the web and shows you niche search keywords. Take note of these and incorporate them into your keyword discovery. Timing: Keyword discovery and establishing your target market should take place before the site’s pages are designed and built. This process can give your designer a good feel for what to craft on your website, and will help you decide the structure of pages to best suit user and search engine needs. Tip: Organise your content around the user’s needs and not the structure of your company – these are two different things. Think about how people will navigate the website and what needs to be on offer for each page. This is critical to creating a good user experience. Timing: You want your content to shape the web design, rather than the other way around – so do your page mapping right after your keyword discovery before the site hits development. Having a sitemap allows you to find gaps in content, allow your team to collaborate and identify a relevant design and digital strategy. Identifying potential content issues that could affect your site’s design and development can also save you time and money in the long-run. When you get to the nitty-gritty of actually writing your website’s copy, you need to consider how it reads to humans as well as search engines. Luckily, Google is really good at understanding semantics and recognising the intent behind a person’s query. This means that you can prioritise writing for humans and rest assured that Google understands it and ranks your pages for related keywords. Gone are the days of stuffing keywords into your copy to rank – successful websites these days balance the insertion of relevant keywords as well as creating quality content that’s super useful to their customers. Tip: Ask yourself what questions people need answered on each page of your site – this will help ensure you cover off the answers within your copy. Ensure the purpose of your page and the action you want users to take is clear. Timing: Writing content generally takes longer and is more involved than what people first think, so make sure you start this early enough so when your new site is ready for you to enter content, you’ve got it ready to go. The later you leave content writing, the more it can hold up your website going live at the end.